If you’d asked me to place a bet on the conditions for the final round of the PMBA enduro series when I booked, I’d have happily put my money on there being at least as much mud as at the first round back in March. But either the weather gods were smiling on the organisers – or they’d already used up their allotted quota of mud for the year – because I’m happy to report that the dry weather of the week leading up to the event held until race day. This meant that the weather was teetering between overcast and hazy sunshine all day and – more importantly – the off-piste trails at Gisburn had dried out nicely. As I was the only member of the Mackerel and Laphroaig Racing team at this round, I had arranged to meet up with Stuart from Blue Flow Bikes – the UK importer of the Hammerhead Thumper which I was riding. While parking up and faffing I got chatting to the bloke parked next to me and invited him to ride around with us for practice. It then transpired that he (Dan) and Stu were long-lost pals and hadn’t seen one another for 20 years odd. Mountain biking isn’t that big a world really, is it? Anyway, I’ll get on with the racing stuff now that I’ve set the scene – and this round’s action was ranged over a 20km loop, which took in 500m of ascent. 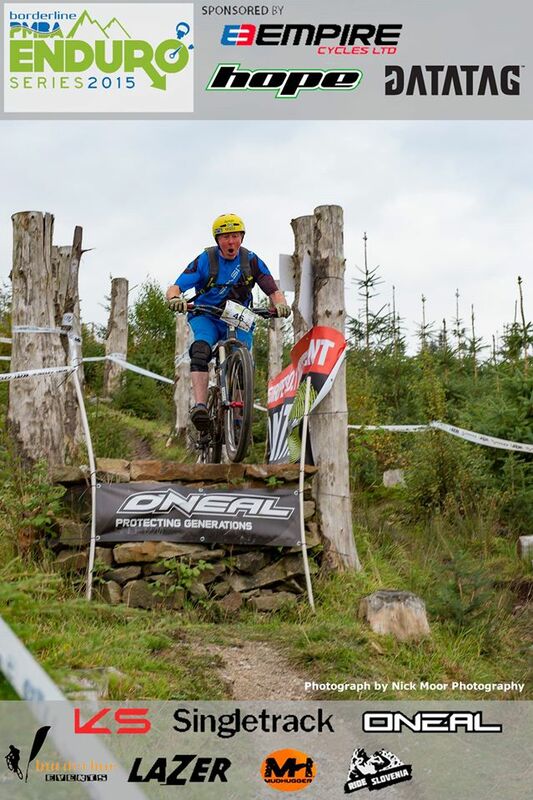 Although this was only half the climbing of the previous round at Grizedale, I somehow managed to finish my practice lap more knackered than I had in Cumbria. Thank god for the fortifying powers of a ham and cheese sandwich and a cup of tea – because I’d managed a miraculous recovery by the time we set out for the race lap. Who needs EPO anyway? Stage one was entirely off-piste through tight pine trees, with plenty of roots, compressions and ruts to deal with. It began more or less flat, then tipped gently downwards. 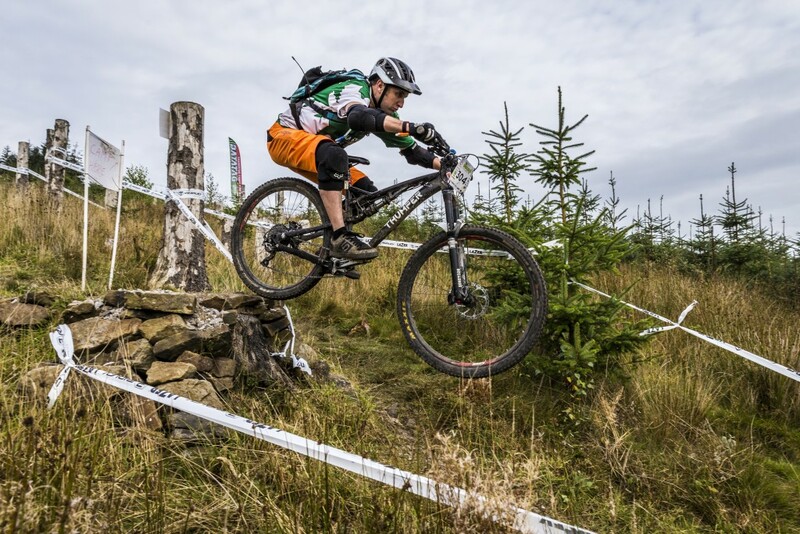 Named Loamudgeddon, it had been almost exclusively mud in round one of the series – and had been a real chore to ride – but today it was running fast and giving much more grip, with only the polished roots and the odd awkward rut really waiting to catch us out. I had a good run, keeping my momentum and just having a couple of little mistakes – including riding into a tree with my hand and coming briefly to a dead stop. 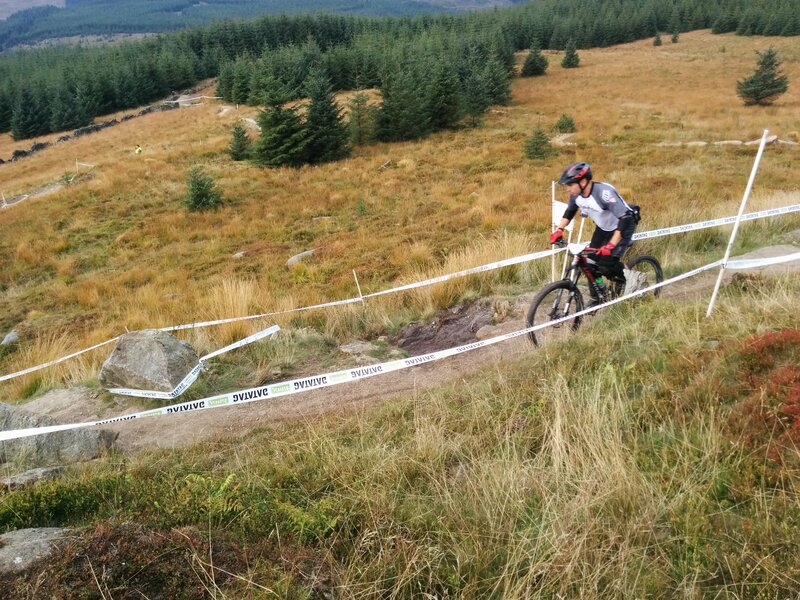 After all the pumping and weaving, there was a faster bit at the end as the trail straightened out and led into a sweeping corner before a little drop and (if taking the fast line) a small bank to get back up before the final corner or two. “The Slab” at the start of stage two. 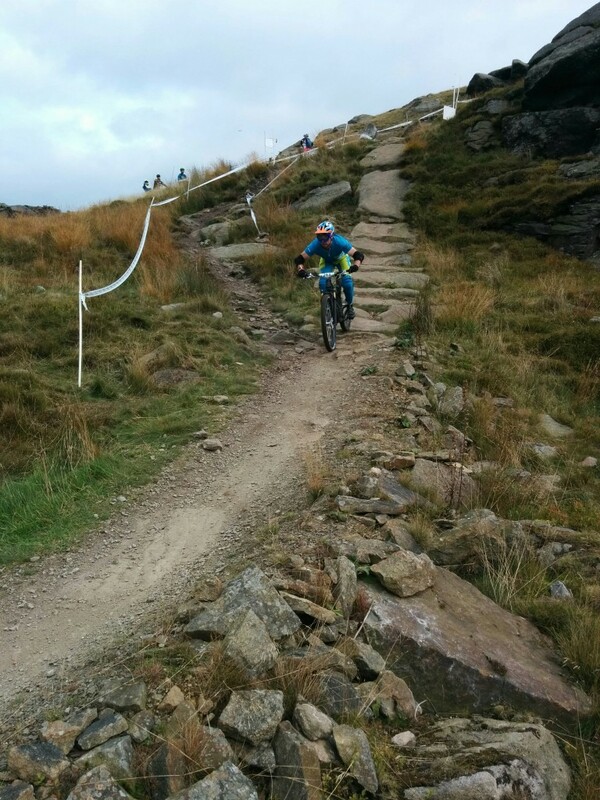 The transfer from the bottom of stage one to the top of stage two was the epic climb of the race, taking us up much of the trail centre ascent to the top of Whelpstone Crag (I think). From here the stage began with a steep-ish roll down “the slab” into a fun trail centre descent with a few kickers and sweeping corners. This led down into the woods for more typical trail centre kitty litter corners and spat us out on a fire road for the climb up to the beginning of Hully Gully. 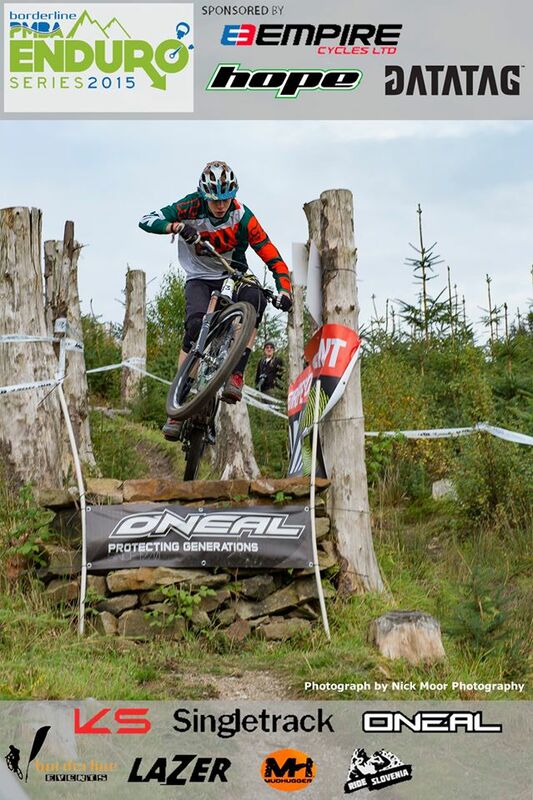 This was a pretty big in-stage climb by UK enduro standards. I know 20m vertical might not sound like much, but when I hit it already at almost maximum heart rate it felt like a lot more than the one-and-a-bit minutes it took. Heading off down stage two. I wouldn’t say I enjoyed it, but I was content that I’d given it as good a go as possible with flat pedals and a heavy full sus bike. Dropping into Hully Gully I was happy to get a bit of respite, just putting in the odd pedal stroke and trying not to brake on the huge bermed corners. The recent repairs are a credit to the volunteer trail crew and there was a noticeable absence of braking bumps and random holes. The last bit of the stage was my favourite and I was happy to still have a bit left in the tank as the trail slackened off and turned a corner – requiring a combination of pedaling and pumping to keep the speed up as the finish line (placed immediately before a water splash) loomed into sight. We stood around on the grass at the finish for a while as Stu fixed his flat tyre, watching riders come in – most needing a moment or five to regain the power of speech after four minutes of hard effort. One particularly focused rider managed to bash the finish post and fall in the stream, while another poor lady racer was so frustrated to have flatted that she was fighting back tears. The finish of stage two was probably the happiest sight on the entire course. While stage two was one for the XC crew, stage three balanced things back up with a much stronger DH focus. Starting in the trees above the “leap of faith” jump (which was taped into the course for the super-keen), it featured a few simple turns before taking us down the “easy” DH line, which features a few 2ft and 3ft drops and some deceptively tricky corners – tricky in that it’s easy to go off line and come to an undignified halt as your front wheel washes out in the thick gravel beside the trail. Knowing this from previous visits I concentrated on keeping my momentum going and spotting my line – with just a bit of Doddying for the cameras as I hit the drops. The DH line ended with a nice rooty, off camber stepdown as we headed into the woods and over a couple of small kickers, then a quick right-left (but not too quick after seeing other riders come a cropper) and back into the woods on the other side of the fire road. This is where the best riding of the day (in my opinion) was to be found – and I managed to nail the entry line I’d rehearsed in practice, taking the first bit slow and then cutting hard left into a grassy ditch and avoiding the tricky roots that had been catching loads of riders out. This left me carrying good speed into the loamy, bumpy but very fast trail that followed – which felt a bit like the Return Of The Jedi speeder bike scene, if it had been filmed in Forestry Commission woods. 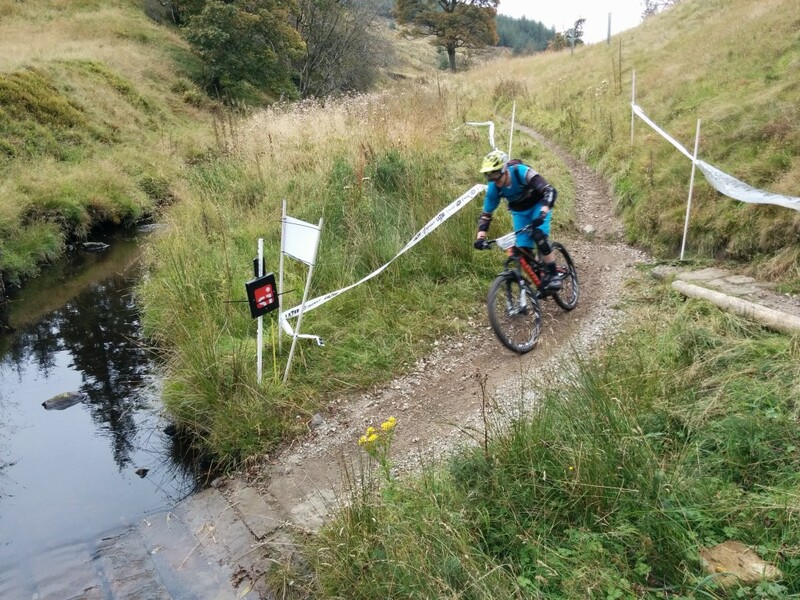 After the flat out bit there were a few multiple choice bits and a long off-camber bank which I opted to stay high on for safety, and because it was fun to plunge off the end and carry as much speed as possible down to the finish line. Another solid stage then, this was going unusually well so far. A second schlep up the fire road climb beside the Hope Line followed, which spaced the racers out nicely so that we only had a short wait before we were heading down said Hope Line for stage four. If you haven’t ridden this, it’s a kind of “trail centre downhill” trail, with lots of small jumps, even more corners (many of them flat), three table tops and a little drop or two. It’s not exactly my kinda trail to be honest, but I flicked my climb switch on and just tried to make it round the flat corners without the front wheel washing out, while also pedaling as much as possible. I do enjoy the bottom section where the trail opens out after a drop between two trees and finishes with a fast series of closely-spaced jumps. I’d done some skills training here early on in the year and it was rewarding to be able to put that scrubbing into practice as I tried my best to make up for what had felt like slow progress through the middle section. From the bottom of the Hope Line it was a short pedal along to the start of stage five – which was made up entirely of trail centre tracks but had plenty of roots, tricky corners and awkwardly placed dips to contend with. Since this was reasonably flat and involved a fair bit of spinning back up to speed, I was starting to regret not fitting SPD pedals for the race – they’d have been a real bonus on all the trail centre-based stages in fact. But I still thought I’d made a decent job of the day’s racing – with just a couple of mistakes on stage one and a small error at the start of stage three sticking in my mind. 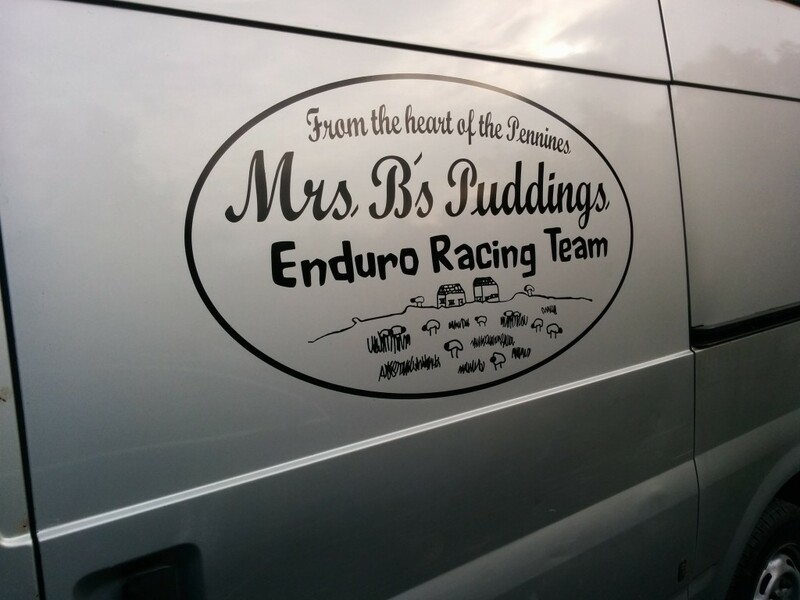 I don’t know if there was a prize for the best van livery, but these lot were robbed if they didn’t win it. So when we came to hand in our transponders at the race tent and collect the printed slip of our times from the SPORTident guy I was dismayed to find I’d clocked up a time of 14.59 – which appeared to be well off the pace. My ambition had been just to get in the top half of the field to be honest, having sat dead on the midway point in my last two races – where I’d felt I’d not ridden my best. Instead I was 42nd out of just under 80. Hmmm. So I had a disappointing result, but hey ho – I also had a full day of riding on some fun, well-thought-out stages with friendly company. Kudos again to Kev, Mike and all the unsung heroes who make these events run so smoothly and with such a friendly vibe. I’m sure I’ll be back next year for more, even if I’m not going any quicker. If you enjoyed this article, please click on the Facebook box down at the bottom and “like” our page. Or “follow” us on Twitter and Instagram. In fact – please do all three.